The Fall of the Berlin Wall was a monumental event, felt around the globe. In Germany, it unleashed a creative episode to rival that of the early 20th of the century. Major artists emerged in a wholly fresh movement, shifting the aesthetic everywhere. Enter Jan Kath. Bernd and Hilla Becher , Thomas Ruff, Anselm Keifer, and Gerhard Richter all can be seen as influences his work. 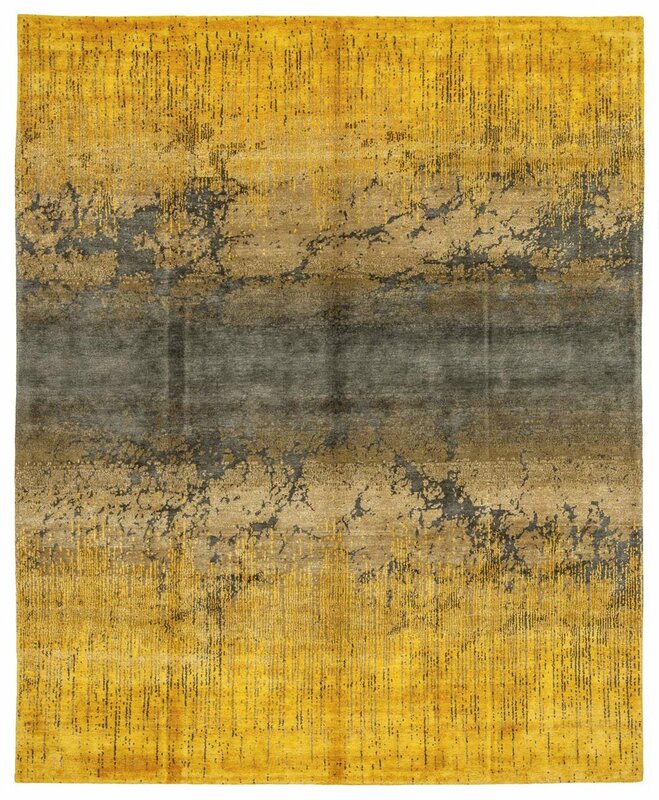 His need create carpets that spoke to this new feeling have permeated the design world. So ahead of the curve, they have been knocked-off continuously. Come and see the real thing, in wool, silk, and nettle in our galleries, now through January 26th. Jan Kath, who is now internationally recognized as one of the most important carpet designers in the world . Jan Kath is from the third generation of a family of carpet dealers who have branches in the Ruhr and in Berlin. When he was just a young boy, he and his father visited manufacturers in Iran and Nepal. These experiences educated his eye and awakened a fundamental understanding of color combinations and proportions. At the same time, Jan Kath never wanted to follow in the footsteps of his parents, and never wanted to continue running their business for them. In order to find his own way, he travelled through Asia and the Middle East when he was 20 years old. During his road trip, he wound up, more or less accidentally, in Nepal. There, friends of his family offered him the opportunity to start working as a quality controller in their carpet production. His "connection with the world of carpets" was reestablished. Later, Jan Kath took control of the manufacturing process, and began to produce his own designs. Inspired by numerous trips through vibrant metropolises like Paris, Istanbul, New York, Tokyo, Beirut, Sydney, and, last but not least, his home - the Ruhr, with its archaic industrial culture - Jan Kath quickly developed his own individual signature. While the allure created by imperfection, erosion, and transformation plays a central role in his designs, Kath is "uncompromisingly conservative" where quality is concerned.